When that red-faced becostumed gentleman announced the birth of Prince William and Duchess Kate's baby boy by holding a scroll and yelling, I remember thinking, Is this the IRL Wee Willy Winkie? followed by Boy is the monarchy both charming and weird and outdated. Well, folks — I have to issue a thought retraction. 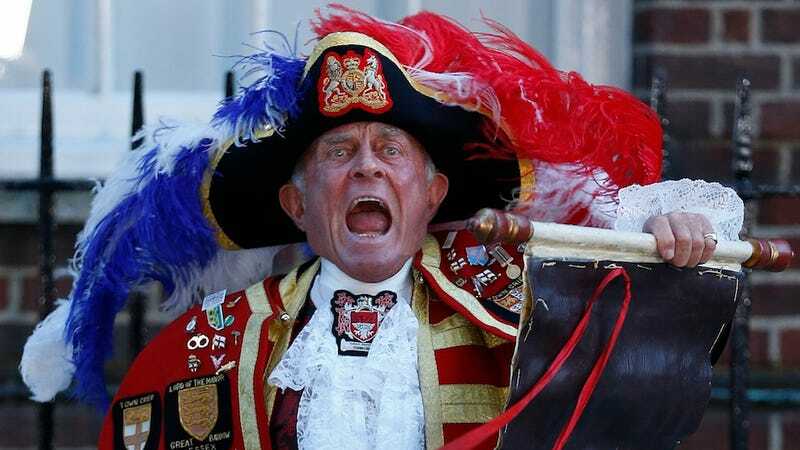 That town crier guy has nothing to do with the monarchy. He's just a guy who goes around yelling about the monarchy. I love this guy. I am in love. According to the AP, the perfectly-named Tony Appleton serves as town crier (awwwww... ENGLAND you are ADORABLE) in two smallish towns (he also serves as a "toastmaster" at weddings and ba(r/t) mitzvahs and owns a nursing home), but that he doesn't work for Buckingham palace. After he was tipped to Baby King George's birth, he just showed up to the hospital in costume and yelled ""Oyez, Oyez" and the rest is cable news history. Rachel Maddow also misreported Appleton as an royally affiliated official and issued a correction to her viewers once she became aware of the error.